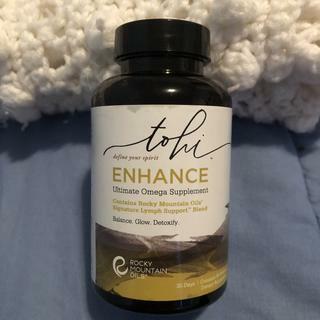 Tohi’s’ Enhance Optimum Omega Supplement combines a rare combination of Omegas 3, 5, 6, 7, 9 and Vitamins D and E in one supplement to make up for deficiencies caused by diet, lifestyle, and environment while enhancing the effects of the other Tohi supplements. Omegas are fatty acids that play an important role in brain function, support a healthy immune system, and strengthen hair, skin,and nails. Enrich your nutritional regimen with Enhance, infused with our Signature Lymph Support Blend. Lymph Support is a blend of Myrtle, Sage, Nutmeg, Geranium, Myrrh, and German Chamomile essential oils. Flax Seed Oil promotes healthy skin, nails, and hair. 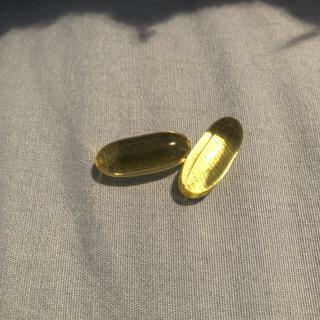 Take 2 softgels daily in the morning. Enhanced with our Signature Lymph Support Blend. Spearmint, Myrtle, Sage, Nutmeg, Geranium, Myrrh, German Chamomile. I’ve used it for a week and my skin has cleared up so much I can’t even put it into words. I love this!! I haven’t been taking this product for very long but I do feel a difference already. I used to have a lot of overall pain and I believe this has helped me with my pain. I don’t have fish burps either which is really nice. I’ve taken other fish oil pills that had that terrible side effect so I’m glad this doesn’t. I already re-ordered a bottle and will definitely continue to reorder it. I’ve noticed positive results since taking it. Good digestive aid. Easy to swallow. I started taking enhance about 1.5 months ago just for overall health purposes- not for any specific reason. I've notice that my hair is growing and thickening which is great. Another great thing about this supplement is that the fish burps that usually come along with taking fish oil don't taste like fish oil- they taste like essential oils! Love this product. Unfortunately it is a little expensive. And only can get it when on sale. It's a great product! I like it better than regular fish oil capsules. I love RMO and was super excited to try these. Overall I do like them however I feel like I get the "fish burps" after I take them. I hate the taste of this. The fish stench is real strong I had to take a sweet right after eating it. Even my fingers smelt of fish for a couple of hours even though i held it for 2 secs. Not sure if I see any difference yet cos it is after all internal. Took the defence pills and that was real good as I really didn’t fall sick but with enhance.. I can’t tell much yet. Not sure if I will buy again as the fish smell is really too strong and smelly. Thanks for the review! We're sorry to hear that the scent didn't sit well with you. We hope you'll be able to enjoy some of our other products in the future. Feel free to reach out if you ever have any questions on aroma or would like some suggestions. Thanks! BEST ANSWER: The percentages for our supplements were designed for adult use only. If you’d like your teenagers to take them, we recommend consulting with your physician. Since this has fish oil in it, will it cause fish burps or leave a fishy aftertaste? BEST ANSWER: We have had great feedback that this supplement does not cause fishy burbs. it doesn't leave an after taste or cause fish burps. The pills are a little big so I take one in the morning and one before bed. If I take them both in the morning then it does seem to cause an issue For Me with acid reflux. Since I split them up I have had no other issues. Great product! I take this everyday and have not had any problems with fish burps or any fishy aftertaste. I am very happy with this product!! And with all the the RMO products. I also take the the nourish supplement and use many of their essential oils. Great products!! Great company!!! I have found there to be an aftertaste/burp but it is not fishy! It tastes like RMO's Lymph Support Blend! Not bad! I haven’t had any problems with “fish burps.” In fact, I haven’t noticed any fishiness when taking Enhance. I take this and I haven’t experienced fish burps once. I love this. Do you need vitamin k to absorb d? BEST ANSWER: Vitamin D is know to work best with Vitamin K. The Vitamin K in our supplements is provided through the wheat grass in the ingredients. Consuming enough healthy fats absorbs vitamin D. It is a fat soluble vitamin. Maintaining a healthy gut is important. Hi! Can you explain the benefits of taking it in the morning vs. at night? Also, should it be taken with or without food? BEST ANSWER: We recommend taking it in the morning because it is the most beneficial time to absorb nutrition throughout the day, but you are able to take it any time of the day. You can take it with out without food, it all depends what your body may require. Is enhance free of PCB's? BEST ANSWER: Yes, our Enhance is PCB free. Does this contain any shellfish? What do you do to insure the fish is not contaminated with mercury or radiation? BEST ANSWER: We really wanted to pack these supplements of as many plant-based ingredients as possible. We've chosen Pomegranate, Olive Oil, Flaxseed Oil, and Cranberry seed oil to provide as much of the Omega's as possible from a natural, plant-based source. The product is produced in a GMP Certified Facility and we are happy to say that the fish used is 100% mercury free. I have a hard time swallowing as it’s so big. Any tips on taking it differently? Unfortunately, the supplements are designed to be taken internally and we do not have other ways of taking the Enhance supplements at this time. However, the Enhance bottle does contain Lymph Support which you can buy separately and use it as a topical application. Can you tell how much of each of the oils? For example, how much fish oil mg? How much flax oil (by mg)? BEST ANSWER: Unfortunately I am unable to provide this information the formulation of the product is proprietary information. Does this supplement contain soy? Thanks! BEST ANSWER: No, Enhance does not contain soy. I'm wondering if anyone has tried this for lymphedema? I've started using these specific oils on my one swollen leg but I'm wondering if ingestion will work better. BEST ANSWER: We are committed to providing quality products and exceptional service. To best guide our customers, we categorize our various singles and blends into seven collections on our website. Each collection can help with a variety of needs. We wish we could help provide the advice that you are needing. Unfortunately, we cannot diagnose health conditions or make any treatment recommendations. To find additional answers to your questions, we recommend consulting an aromatherapist or trusted healthcare professional. I have not tried it for your specific but you might get some drainage with cupping from the ankle up. Start with using lavender in the groin area to open the lymph channel, warming it. Then using a medium to small silicone cup work a bit on the upper thigh to warm, go to the ankle up, then your finish will be from the knee to the groin. Can you take the difference supplements together? BEST ANSWER: Great question! Our supplements can be taken together. BEST ANSWER: Great question! The omega-3 is not enteric coated. Is there any fish protein chance of contamination of fish protein in this supplement? BEST ANSWER: This product contains Fish Oil as the source of some of the Omega's. These are listed in the ingredients. Is this safe during pregancy? Does it contain DHA as well? Can I use boost, enhance, and nourish together? BEST ANSWER: Yes! You definitely can. Using the Tohi Supplements together creates a wonderful synergy. They actually have the potential of helping each other work a little better in providing overall wellness. Keep in mind to still use the usage instructions on each individual bottle or on each product page. BEST ANSWER: The Omega 3 is from Tuna & Krill, the Omega 7 is from Pollock. Hi there! Where is your fish sourced from? BEST ANSWER: There is no corn in Enhance. Does this item contain gluten? Vitamin E can be a hidden source of gluten. From what is your Vitamin E derived? BEST ANSWER: There isn't any gluten in Enhance, that why we're proud to display the Gluten Free symbol on our products.